In order to make it easier to manage offline maps, I usually recommend creating separate offline maps for separate geographical areas. However, this makes it necessary to switch maps when looking at different parts of the map. Unless you chain maps together using the fallback map feature. 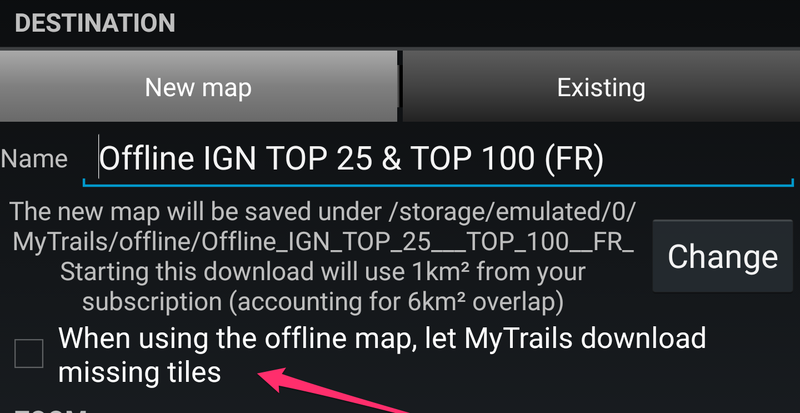 Most maps, and particularly offline maps, support setting a fallback map. To do so, tap the name of the map in the Map manager, and then the Select… button in the Fallback map section. You can then pick the fallback map, which will be used where the main map does not provide a tile. in the main MyTrails view, select map A, and MyTrails will automatically display map B or C in areas not covered by map A. A, B and C do not need to all be offline maps. in fact, it may be useful to select an online map as the last map in the chain, so that there is always something to display. 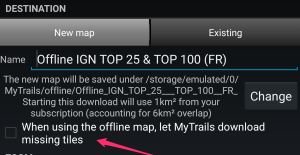 This is what MyTrails does when you create an offline map and check the Let MyTrails download missing tiles option. This entry was posted in Offline maps and storage on 28 December 2015 by frogsparks. Sorry about that, maps.frogsparks.com, the main authorization server, is unavailable since about 9am French time. I will post updates as soon as I have an ETA for restoration. Update: I had to install a new server, but it’s back online as of 18:25pm French time. Thank you for your patience! This entry was posted in Blog on 9 December 2015 by frogsparks.